A light, airy family villa overlooking the Tyrrhenian Sea. Surrounded by floral terraces and a garden of olive trees, Cala Bianca is a well-located summer house within easy reach of the beaches, rocky coves, restaurants and shops of Scopello and Castellammare del Golfo. The cool, comfortable interiors spill out onto a series of shady terraces and an outdoor kitchen that provides an effortless al fresco dining experience. Inside: accommodation at Cala Bianca is on two floors. The main entrance takes you in to a spacious, comfortably furnished open-plan living and dining area with a small kitchen corner (most guests cook in the larger outdoor kitchen), fireplace and large glass doors leading out onto the front and rear terraces. The ground floor is also home to the main sleeping quarters, comprising a double bedroom with access to the front terrace, a single bedroom, a double-twin, and two shower rooms. 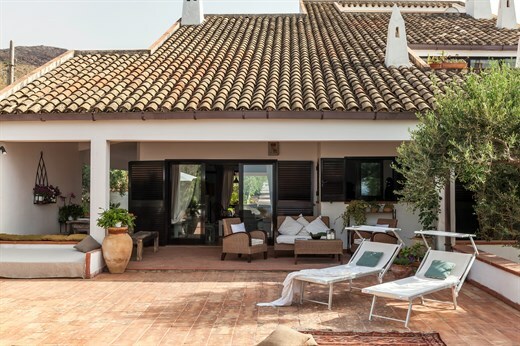 A flight of stairs takes one up to the first floor where there is another spacious lounge area and kitchenette with access to a sea-view terrace, and a double bedroom with en-suite shower room and views over the olive groves. Outside: to the front of the house, accessed from the living area, is a huge terrace that is fully furnished reclining, gazing at the stunning sea views, reading in the shade and dining. On the other side of the house, once again accessed from the living area, is a well-equipped, shady outdoor kitchen and dining area, complete with wood-burning pizza oven. It is here where you will probably cook and eat most of your meals, with the garden of olive trees, cacti and Mediterranean flowering plants for company. There are also two outdoor showers, perfect for cooling off after a day at the sea. The first floor has its own romantic terrace offering beguiling sea views, while another flight of steps leads up to a small roof-top viewing point, with 360-degree panoramas. Cala Bianca is located on a quiet unpaved cul-de-sac road which also serves the few neighbouring properties. Due to its position close to the sea, in peak season a few other people may occasionally park along this road in order to access the sea. The beach of Guidaloca is just a couple of minutes drive away, while for the more agile there is a bay down below Cala Bianca. The access to this is via quite a steep cross-country path that starts right in front of the house. There is a SCUBA club in Scopello, sailing in Castellammare and great treks to be had in the Lo Zingaro nature reserve. Due to Cala Bianca's position, there is limited cell phone reception in the house but is fine from the terraces outside. There is a landline for use in the villa. The small town of Scopello (5-10 minutes' drive) has a few excellent restaurants and bars and on the way there, there are a few basic shops. The old tuna plant of Scopello, is in a very suggestive setting, and the Zingaro nature reserve offers a range of spectacular walks and some beautiful crystal clear bays for swimming. Even closer, just a few minutes along the road to Scopello is the pebbly beach of Guidaloca with a couple of fully-equipped lidos. The nearby town of Castellammare del Golfo has several seafront bars and restaurants and a daily fish market. The spectacular Elymian/Greek site of Segesta is about 20 minutes drive away and Erice, Palermo, Trapani and Selinunte can all be reached in under an hour. "Overall we were extremely pleased with Cala Bianca." We loved Cala Bianca. The setting, and the views were terrific, and the overall villa layout was very nice. We loved hiking down to the rocky beach below the house. Overall we were extremely pleased with Cala Bianca. Our white villa, Cala Bianca, has three terraces overlooking a sea of blues that would be at home on a Dulux colour chart. Cala Bianca was a really lovely villa. We loved the location - tranquil yet not completely isolated. Cala Bianca is a great place to hang out. Our in-villa pizzaiolo was great. Our holiday at Cala Bianca was an amazing experience. I would recommend Think Sicily to anyone and everyone. Cala Bianca is a great property. Thoroughly enjoyed the villa. It wasn't luxurious but very comfortable. The kitchen was well equipped which we appreciated, as we like cooking. Very satisfied with everything. We would certainly use the services of Think Sicily again and recommend it to friends. House and gardens were great. We went on the couples special offer but the house would have been great for an extended family group. We loved the villa and had a very warm welcome from the owner. The villa accomodated our family perfectly and the view from the front paved area was just stunning. We spent a lot of time swimming in the cove below and exploring Scopello, Castellammare and Zingaro Nature Reserve. The villa was in the perfect position to reach these places but was also in a very peaceful location. The house guide and introduction pack was brilliant and told us everything we needed to know about the property. We got a fabulous friendly welcome. It really felt like we were special guests and that the holiday was well underway the minute we arrived. How did we enjoy our holiday? If the scale went up to 10 it still wouldn't be enough! It's a nice property - lovely views. Good terrace. All great... Lovely villa and location. Its huge! The owner was super friendly, very hospitable, welcoming and generous. The house was absolutely gorgeous. The area around the house was more beautiful than the rest of western Sicily. It was stunning... The wine delivery, waiting for us upon arrival, was a good service. Scopello and the area was delightful... The Zingaro reserve was great and the little bays so clean... The house was lovely to go back to, cooking and eating late into the evenings. It was a very lovely house in a wonderful location... I have rented houses at least 11 times in Italy, and I found your organization the most well organized and the standard of your rentals of high quality. Quel plaisir de contempler l'azur de la mer chaque jour ! Le lieu est magnifique et nous avons pu profiter tous les jours des calanques en contre-bas de la villa, avec ses eaux cristallines.